The moment when Shelby’s beautiful hair went SNIP!!! I keep a relatively small circle of creative folks around me. What I like most about them is they are just as passionate about what they do, be it for fun or profession. Whenever we get together, we are constantly coming up with ideas for our next creative project. It seems a month cannot go by without us getting ourselves into another project. This particular project started as a very loose suggestion after our last photo shoot with Shelby. From the first time I met her I always thought she would look amazing with a shot A-line haircut, but that would be a very tough proposition. If you haven’t met Shelby, she’s a towering 6 feet tall, athletic and has (until this past week) long deep red hair down her back. She most definitely has a physically commanding presence. At the end of our previous shoot she expressed interest in cutting her hair so I began the gradual process of pitching my idea/vision to her. What I like most about Shelby as a model, is she is very versatile, willing to push her boundaries and explore the unknown. I feel so many beautiful women often hide behind their hair and never truly explore their beauty in all it’s complexity and dimensions. Strong, sculpted shoulders and graceful necklines are almost always more desirable than the best hairdo. Long hair also conceals the back can ultimately curves that so critically define the female form. 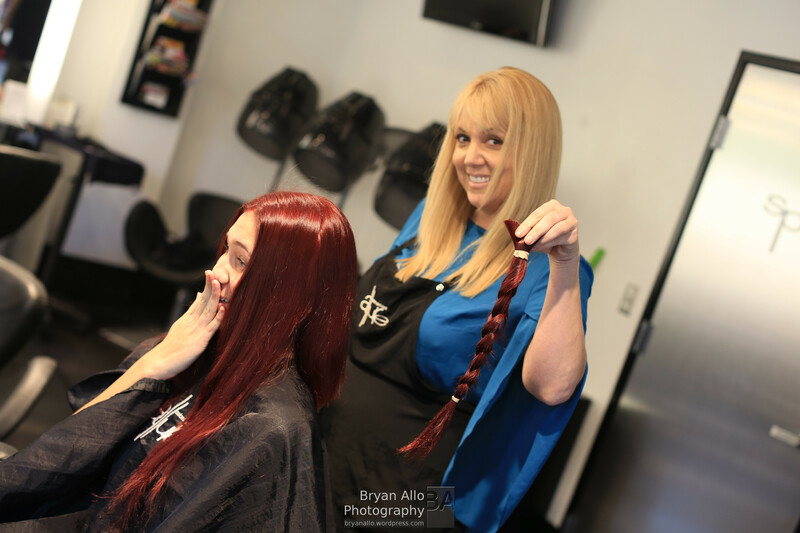 We settled on the Allure Salon and Spa downtown and were thrilled to have the owner Missy O’Daniel work on Shelby. Makeup was done by Toni Cisneros. Thank you to all the staff at Allure Salon and Spa for hosting us. Thank you Shelby for taking a chance on my crazy idea. It was my pleasure to be a part of your first haircut and makeover of sorts. Here’s to many more creative, fun projects. All done and ready to shoot!